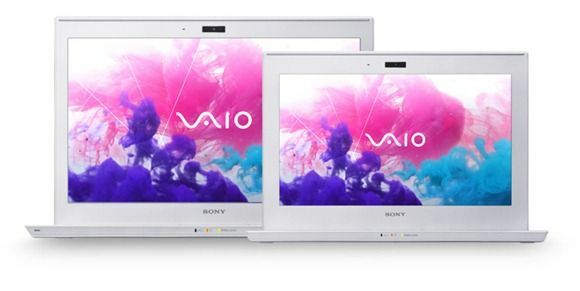 Pre-ordering for the Sony Vaio T Series has started with two retailers in Germany offering the base 11.6” version and quoting availability in two weeks. Pricing is as we reported earlier this week. Over at the Sony Germany web site, however, there’s some new information to be had on spec options. As I was writing this article an Ivy Bridge model popped up right in front of me. I some specs changing as I refresh so someone’s obviously working on it right now but that Ivy Bridge model seems fairly clear to me. 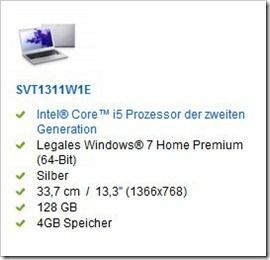 CPU: Core i3-2367M 1.4Ghz Option: Core i7 – Not currently detailed on Sony site. This is an interesting development. An Ultrabook launching with low-cost Sandy Bridge CPUs and a high-end (we assume high cost) Ivy Bridge CPU at the same time. 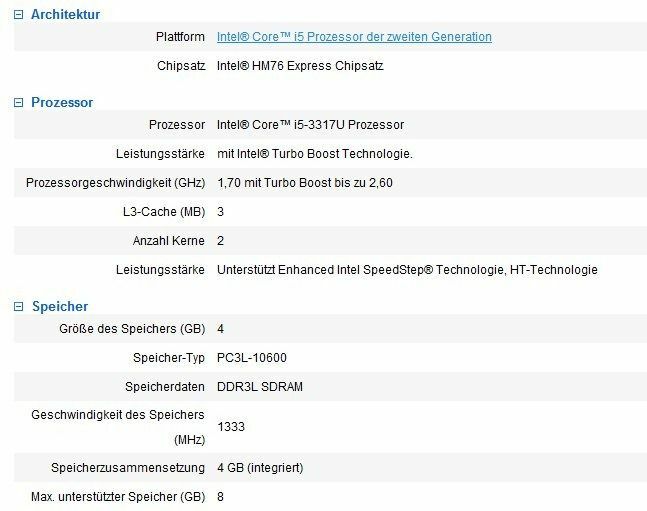 We see that they’ve listed ‘second generation’ Core processor there where Ivy Bridge is actually 3rd Generation but the detailed specs show a set of info that can only link with an Ivy Bridge CPU. As for pricing, we’ve found two retailers in the UK asking for 1000 GBP but specifications do not include information on the CPU. Given that this has just gone up there could be errors. 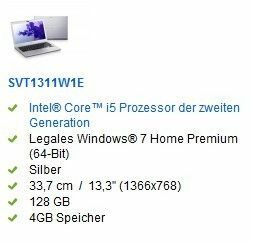 A check over at the Sony UK site shows a second model, SVT1311X9E, also with the Core i5 3317U CPU. This story clearly developing so check back for updates and if you find out anything new, drop a note in the comments below. Glad to see this, Sony has for a long time made some beautiful ultra thin devices, it wasn’t so exciting (given their ‘premium’ reputation) when we learned the other day that they were entering the Ultrabook sector at this stage with a Sandy Bridge model. Feels better now that they’ve got Ivy Bridge in the works too! Is that an 11″ computer or just a gigantic bottom/top/side bezel with a cute little screen in the middle? While it’s nice that their 1 of the few making 11″ devices, it doesn’t do much good if it’s barely smaller than some of the current thin bezel 13″er’s. took the words out of my mouth. I can’t deal with these huge bezels!! for looks and practicality! Are these models Sony T11& T13 will also available with in build 3g? I think for ultra book 11” & 13”to compete with tablets( ipads/tabs), they must have in built 3g/4g in built to make them truly mobile. We live in 2012, this should be full HD or at least 1600 x 900 and matt screen options if you please. 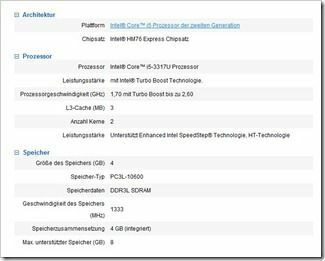 « HP Envy 6 Pops Up on Australian Site, Reveals a Low Resolution Screen — Missing Discrete AMD Graphics?